Gaana Android App is known by many of us. Its an app to listen online music, radio, etc but what if I tell you that you can earn free mobile recharge by referring your friend to this app. This time you will get upto Rs. 100 free recharge talktime for referring your 5 friends, Rs. 20 for each friend. If you already have this application still you have to update it to get this offer appear. After downloading / updating create account. Now after applying referral code, Login via Facebook. After your account gets created go to Menu [upper left corner, three horizonal lines]. Now click on "Invite Friends". There you will find an option to refer your code / link on Facebook, Whatsapp, etc. Minimum redemption amount is Rs. 50 so you need to refer atleast 2 friends to get your recharge of Rs. 50. Now you need to use Youwave Android Emulator. 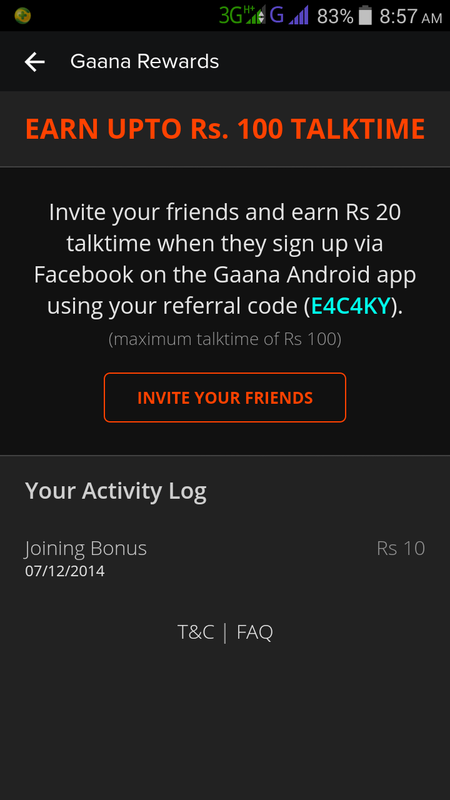 Now install Gaana [latest apk] in it and create new account and use above referral code. Now to refer yourself hard reset Youwave. Now again install gaana apk and refer yourself. Keep on doing this to increase your earning. But as you know that it has a limit of Rs. 100 so after complete 100 use different referral code.